Local 743 Director said many of the workers are dissatisfied with retirement benefits and the three year 1.5%, or $0.25 per hour, wage-increase the University has offered. Teamsters Local 743 rallied outside Levi Hall on Wednesday. Outside Levi Hall this past Wednesday morning, clerical and maintenance workers from the Brotherhood of Teamsters Local 743 spent Administrative Professional’s Day making their case in ongoing contract negotiations with the University. The local, which represents over 700 campus employees, called the protest after receiving unsatisfactory contract negotiations from the University since last September. Local 743 Director of Field Services Catharine Schutzius said that many of the workers are dissatisfied with retirement benefits and the three-year 1.5%, or $0.25 per hour, wage increase that the University has offered. She also said that the low wage increase does not support employees who work longer hours or hold more than one position due to low staffing. For two hours, Schutzius and Union Representative Jarvis Gutter led about 30 of their fellow Teamster members through the protest. According to fourth-year Spencer Mcavoy, the co-coordinator for student-led organization Fair Budget UChicago, the rally is the workers’ first protest due to a contractual clause that bars workers from protesting. The workers are now allowed to protest since the three-year contract ended last February. Students from Fair Budget UChicago, Graduate Students United (GSU), Students Organizing United with Labor (SOUL), the Fight for Just Food Coalition, and Student Government (SG) slate United Progress (UP), also joined the protest, along with representatives of newly organized non-tenure track faculty. Third-year SOUL member Psalm Brown stated that he and other representatives from the student-run support group have a duty to support campus workers when they feel that the University has not sufficiently responded to their requests. “When campus workers are fighting for better working conditions, SOUL wants to be supportive and show student solidarity. 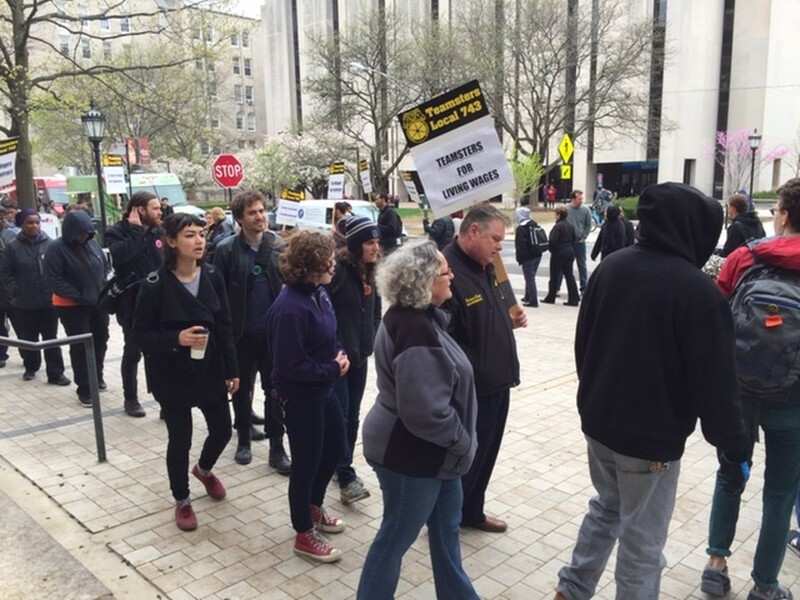 By joining the Teamsters and rallying with them, we want to show the University administration that students care about the workers who make this campus run on a daily basis and that we expect them to be treated and paid fairly,” Brown said. Second-year Eric Holmberg, who is running for SG President under UP, said that he and his fellow running mates believe that too many workers are making less than $15 per hour and that the University should work towards increasing their wages by more than 1.5%. Holmberg’s slate has been endorsed by the local’s stewards. “There are many workers making less than $15 an hour. That means they deserve pensions and step-increases, and the University should negotiate with them on those things. More broadly, we can afford to pay our workers a living wage. It’s good for students, it’s good for staff, and the University has the resources to do it,” Holmberg said. Holmberg later stated that the low-wage increase affects him as a campus worker and that he hopes to target the issue if elected to SG. “I work a campus job working $10 an hour, so I know what it’s like to work many hours to pay for school. I’ve known about the Teamsters because many of the members work in our dorms... I’ve met with union stewards, and so I know what the issue is because people talk about it,” he said. Lastly, Holmberg explained that Fair Budget UChicago, which advocates for a living wage of $15 per hour for all campus workers, has consistently been denied meetings with University President Robert Zimmer and former Provost Eric Isaacs, so he and his slate hope to address wage increases and other benefits with new Provost Daniel Diermeier. Schutzius added that Teamsters has represented University workers since the early 1980s and will continue to protest if the University is unresponsive. “We’ll continue to escalate our activity until we get an offer that’s fair,” she said. Teamsters 743 is an affiliate of Teamsters Joint Council 25, which represents more than 125,000 men and women throughout Illinois and northwest Indiana. The local currently supports approximately 10,000 Illinois workers. Besides the protest, the union held a vigil on behalf of UChicago and the University of Chicago Medical Center’s (UCMC’s) 1,500 workers to raise awareness of low-wage increases and unsubstantial retirement benefits. The vigil was held last January, when workers were still under their contract with the University. The University declined to comment on the Wednesday rally.